The Stingray vision system provides relative position information from underwater camera images. The frame grabber captures data from the cameras mounted on the front and bottom of the hull, and those images are then processed using object detection and recognition software. 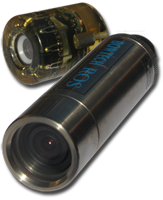 A Remote Ocean Systems CE-X-18 underwater camera is used to view objects in front of the vehicle. 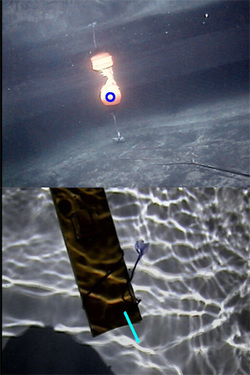 The vehicle also uses an Inuktun FireEYE underwater camera that faces downwards from the vehicle. Each camera outputs an NTSC signal with 525 horizontal scan lines that the Embedded Technologies VFG7330ER frame grabber can convert to either an MJPEG or MGPEG-4 digital signal. That digital signal is then used for object detection and recognition by the software on the vision node. The object detection and recognition software used in the Stingrayâ€™s vision system was developed by the iBotics team using the OpenCV computer vision libraries. Captured images are decomposed into hue, saturation, and value (HSV) components so that a single coordinate represents all color information independent of lighting fluctuations. The planner sends commands to the vision node, instructing it as to which objects it should be looking for. A new image is created for the specific mission task by converting the received image into a black and white representation where white symbolizes the color associated with the current task, and black is everything else. To reduce the unwanted effects of image noise, the images goes through a segmentation process where morphological operations are performed on the image to dilate and erode the image resulting in a single, solid object. After the segmentation process, the binary-valued pixels of the image are added. If the resulting sum is greater than a predetermined threshold, the object is considered present in the scene. To use the vision data for navigation control, the objects must me localized within the image once they are detected. To determine the relative position of an object, the centroid of the object's area is calculated and reported to the planner. For tasks that require the vehicle to maintain a fixed position relative to the target, the difference between the center of the images and the center of the detected object is used to drive the PID loops. Determining the orientation of objects, such as pipes, requires additional calculations. To find the orientation of pipes relative to the vessel, a least-squares line estimate is made based on the objectâ€™s edges. From this, a relative yaw angle is calculated and sent to the navigation subsystem.